A long time ago, around the mid-1990s there was a war between two toothpaste brands. It started with Pepsodent claiming it was 102% better on fighting germs than the market leader. That market leader was obviously Colgate. Some of the Pepsodent ads targeting Colgate negatively lip-synced a kid stating he was using Colgate. The matter ended up in the courts and nobody really bothered what happened after (Read here). But the Pepsodent guys had got their message out for a good few months by the time they pulled their ads. All this over a couple of toothpaste brands. What the story doesn’t tell us is dental care may not have much to do with toothpastes. Maybe the brush actually does more but even that may not be entirely true. For some time now Root-Canal treatment has been popular to fix teeth that are beyond fillings and minor repairs. But what is not commonly known is that even the Root-Canal treatment has been found inadequate not by common Dentists but by a former head of the Root-Canal department of Dentistry. Read these about Dr.Weston A Price and the article “The Root Canal Cover-up” by another specialist, Dr. George Meinig. You will be surprised with what you discover. Dr. Price’s research states somewhere that tribals in Africa who never used toothpastes or toothbrushes in their life never experienced so many dental problems. And here we are, fighting over toothpastes. An online friend of mine, when asked about root canal, jokingly said the Dentist principle was: “Drill, pull, fill and bill… Lucky if you don’t kill”. Most of us accept the root canal treatment without thinking twice. We trust dentists the same way many still trust newspapers. But doctors mostly maintain a code of ethics while newspapers and the media in general don’t. Even the ethics codes they do have are often flouted. So lately a newspaper that cries itself hoarse over “Journalism of courage” and is challenged on this blog and also in the MSM, it cries “Defamation”. Typical of media isn’t it? Well, if you told your Dentist “root canal is a load of rubbish” imagine the reaction. (Don’t try it though because the doc intends no harm). That’s the response that one gets from media when someone calls their load of rubbish. And I can’t be sure that the media only intends “good” like the doc. Just as Dr. Price’s research report on root-canal of early 20th century was “buried” for many years, some truths about media may take longer to uncover. Dr. Meinig exposed the root-canal cover-up only in 1994. So the Indian Express was chasing Google to knock off some of my posts because it had harsh criticism of the newspaper and Mr (Redact). So I get a mail from Google summarising with the following line: Two blogposts “are in violation of the terms of a court order passed in a matter brought by the Indian Express against our company”. So this is not new, as we shall see. The IE has done it long before. Now, that order is not in connection with this blog but in some other connection and apparently IE had an agreement with Google in 2008 (When this blog didn’t exist) to pull content that “contains defamatory towards, contains illegal hate mail about Mr (redacted)”. Since the name has been redacted it’s hard to tell who that Mr is, isn’t it? For the record, MediaCrooks (MC) is not in the business of “manufacturing news” or reporting news. MC just analyses and assesses reports from a different angle that our regular media may not do. The site only dissects their spins, distortions and deceptions. So what exactly was the problem for the Indian Express or its editors? You see, their problem is that this site had commented on their “Raisina Hill Army Movement” article of April 2012. I had reproduced certain quotes and media content about the article and Mr (Redact) which IE and its editors find “defamatory”. Hmm! Maybe the editors and IE as news reporters themselves have forgotten that quoting news reports for the purpose of analysis does not constitute defamation unless the publication of such quotes is specifically prohibited by a court. The “root” cause of this heartburn at IE is comments made by Vinod Mehta (of Outlook) in an issue of the Open Magazine. IE & others have filed a 500 Cr defamation case against Mehta and others for rubbishing the “Raisina Hill” article. But the article still exists online as anyone can see, which means no court has ordered the article to be taken down. Read “The Mother of all mistakes” at Open Magazine and also an analysis at MXM “Apology + Rs 500cr: Is Indian Express right in sending Open a legal notice”? If there was indeed a court order prohibiting the mention or analysis of the Raisina Hill blooper I doubt these pages would still be online. That apart, the IE notice to Google also objects to certain tweets by Mr. (Redacted – Not of IE) and reproduced on this site for supporting the arguments of the related posts. Those are very damning tweets. Somewhere in the notice to Google, IE claims Mr (Redacted – Not of IE) has apologised for the tweet. As far as I know if there was any apology, no tweet relating to that particular issue was removed and still exists on Twitter. A screen shot of that tweet taken on January 31 is retained by me for records. So the apology bit is another load of rubbish unless it was privately whispered into the ears of Mr. (Should I say Redacted? Haha!) And then Mr. (Redacted) complains about credibility. Let’s see! I guess all these preferential ads for IE are pouring in for their “Journalism of courage”. What about IE’s complain about damaged credibility? Well, it looks like our media has for long enjoyed the privilege of damning, ridiculing and rubbishing anyone and any entity without anybody questioning them. If Mr. Redacted cared to hear (which I doubt) about the perceptions people now carry about IE then he would quit by accepting responsibility. Now that that the Social Media has started lampooning them and questioning them, they are starting to cry defamation. Aha! And this isn’t the first time we are seeing this wailing by media, are we? A tweet from January 31 from shows what an observer thinks. I can produce thousand more such tweets. How many will you sue Mr. Redacted? The notices being to Google I have altered one of my posts and will be reworking another one. This blog is hosted on Google and I see no sense in taking up a confrontation with them. IE has reacted like Colgate has. Mr. Redacted too will realise root-canal is not a substitute for quality nutrition. Many had often asked if these guys read MediaCrooks. Well, I’m sure that answers a lot of questions. Not only Mr. Redacted but a lot of our media celebs read too and I have no doubts that it frustrates and irritates them. Actually, the better choice would be read and show visible improvement but that is a tougher choice to make than issuing legal notices. Pepsodent pulled its ads after Colgate issued legal notices and went to court. Well, marketing gurus know the trick. Regardless of what Colgate did, Pepsodent got out its message of 102% better. In a contest between toothpastes there is nothing that can really establish the truth. Truth has far lesser chance with our media. The message of Raisina Hill and other bloopers are out across the country. The message has reached Mr. Redacted. Indian Express just BLINKED! Note: The Root-Canal & toothpaste observations/analogies are made based on published papers but should not be construed as dental advice from this blog in any manner whatsoever. Your Dentist is the best judge and advisor. Seriously, do you expect these MFs to change, once they have tested the blood? Only salvation for India and right thinking Indians is wholesale elimination of these WHO$$S. Sincere apologies. It should have been tasted the blood, not tested. But it does not make any difference to these hounds anyway. All MSM are Wh$$$s from Top to Toe as Manish would say. RIP Mr 'Redact' and IE. Thanks to this fool, the brave paper has been destroyed beyond repair. Perhaps he was walking too fast - much beyond his capabilities. IE is much like that other rubbish called Tehelka. Very sad and its a shame 4 all the readers, myself included on top. 1. Unequivocally, you are the best I have seen for decades in Indian journalism. You not only stand tall among those pygmies, but have the morality, the guts, the honesty to speak the truth. Sometimes, I may not agree with you 100% - but without a question, you are no way compared to be among those pygmies of journalism. 2. I do sincerely hope, you continue to write. In fact I was surprised not to see your article in last 3/4 days. Perhaps, this was taking your time. Please do write with the same passion and integrity that comes in your blog. 3. No one has escaped tax. No one has escaped death. No one has escaped system. If the system is corrupt, it will touch people corruptly. The crowd in Delhi and their supporters will soon realize it after more brutal one sided laws are on its way. Justice Verma gave a completely one sided report bashing males. Kamal Hasaan faced the system once truly and talked of leaving the country! I just imagine, what those blind supporters will do when laws come out. And I do hope you continue to expose. This one, as you correctly put, is a blink - I hope you are taking it so. Not many can. The crooks in media are shaken. They today know that Media is no more of considered to be of journalism, but more of dirty politics. What you have done so far is an omen service, which none of our media today are doing. Above all, thank you, for keeping us truly informed. I know such story Indian Express's Marathi sibling "Loksatta" which has significant circulation. It is said that Indian Express survives on "Loksatta" rather than their English Edition. They published a story about Tata Motors's representative visiting Thane Municipal Corporation's officials and corporaters. They struct some deal. When they published this story, there was a public issue of Tata Motors and they were furious about the story. They dragged Indian Express in the courts claiming that due to this false story their public issue was affected and so Indian Express should compensate them by 500 Cr. Believe me, nobody from Indian Express ever represented themselves in the court. Ultimately the case was concluded ex-party. The judge said, he was surprised that nobody from Indian Express ever represented themselves in the court. Even though the 500 Cr. compensation seems too much, I award the damage of some amount, I think 50 Cr. I do not know whether ultimately the court order was executed or not. This story was buried by all media people, under their unwritten code of ethics of not reporting wrongdoings of their tribes. Now Vinod Mehata says that it is all humbug. But they are still doing it. This story was reported only by one rival(any guess?The another of crooks in print media) paper only once on 7th page. If this would have been about some Government official, politician, or for that matter anybody else they would have carried it on front page in 8 columns for days if not for weeks/months. Ravinar, Thank you very much for giving this platform, to highlight media wrongdoings. The walker seems to have Dry Eye Syndrome too along with Alopecia. That's why the blinking!!!! Mr Redact, blinked only once and cannot further because he kept it closed. When do they realize that they have decayed so much - only a matter of time before they would be extracted and thrown into a (Dentist's) bin ;) But then as you said, Colgate lost despite a victory. Ditto here. The purpose is achieved. Bravo! Ravi. Brilliant one again! Am thinking wildly but just wishing aloud---Is it possible that you come up with a newspaper?? Am sure the readership will be even better than whats happening with your blog and you can reach more people,even those who dont come on twitter! Bless you!!!!! Ravi, you not only nail the b*** (read baddies, not anything else) hard but also make them squirm, twist themselves into pretzels and appear completely ridiculous by their own actions and lies. Good work and best wishes. I think its time you move out of Google and find some good hosting company NOT based in India. i salute your courage! you are really doing a lot for society by fearless journalism!! may you win in the end! BTW There is no defamation case against me. The IE is arm-twisting Google, not me. Do not understand why there would be a defamation case against MC. There is no wrong information written anywhere. People spending time and sharing it further, it shows MC is connecting with people. Even if they think of case, they will further lose their credibility. Full support for Ravinar and appreciate all of his hard work. thousands of salutes to you, you're hitting at the right place that's why they are shaking, please continue exposing their nexus, We are standing by your side and don't worry if it require any practical involvement i will be 102% fight with you. In last i want to say to all the media pimps...BRIG IT ON!! Host this blog with some other webhost. Just never use DISQUS for comments, as it never gets load on dial-up connections. Majority web users of India use >100kbps connection. Advantage with Google is that, the estiblishment cannot block your blog directly. They have to instruct Google to do so. I am hoping Barkha and Hammam boy follow suit - not because i want you in trouble but rather i want their masks on hypocrisy pulled down. But, they would be clever , wouldnt they :) ? P.s. : You ought to consider maintining a mirror site somewhere else , just to be sure. It may be a good idea to duplicate this blog at other blogging sites too. We have too many dishonest people in our country who will armtwist google into removing posts exposing them. Publication at multiple sites will make it increasingly difficult for them and all the hosts may not be as co-operative as Google. Thanks Ravinar for writing and letting us know the *real stories* ... More power to you... best wishes always! How does objective criticism become defamatory / hate mail? Google is chickening out. I think some battle has to be fought in Indian courts to decide once and for all on the matter. Otherwise, Google & others have to be prepared for more. Anyway, you are really a hero. Best wishes for more & more revelations, analysis and inspiration. Time for Gurumurthy and Arun Shourie to get into maintream new publishing. We are sick of Chamchas and mouthpieces. Also looks like Journallism of Courage ended with Goenka, Arun Shouri and Gurumurthy. Goenka is no more, but the other two I hope are listening, We need you Sirs. Didn't understand this part about the "blog being hosted on Google"..At least your URL suggests it is an independent site. And how did IE get to know this site if hosted on Google? Ok I see you are using a Google a/c to blog.. Ignore my prev mesg.. Thanks for your effort to brings Indian (specially, so called "educated" like me!) from darkness. Fellow readers, any IT expert out there? I think IT experts need to assist ravinar in alternative ways/IT tools of reaching people (I also think Ravinar is smart enough to take further course of action!) thru web. It is imminent that other media crooks such as BD/SG/beef-eater etc., will follow the arm-twisting tactics. BTW, i would like to deviate tangetially. I request all blog followers to read short videos of Lt. Rajeev Dixit on how multi-national companies kept us in dark. Read videos on tooth paste/danger of using aluminium utensils/shaving cremes/simple technique of VaagBhat for healthy life/Gyaat tentacles/FDI/ etc. etc. His videos literally drag you to day light from darkness. Mr Readact's reaction to this post - OUCH! Great work Ravinar, I dont think Ahmed Patel has read your blog yet, otherwise he would have already complained to Sonia Maam! Keep it up. Excellent work indeed. Keep that going. I remember the case (not his name) where a blogger was hunted down by Barkha Dalal for exposing her in her role in compromising the Indian Army with her coverage and asking to fire Bofors for the camera etc. He "succumbed" but very intelligently, he wrote a blog (which he knew would be taken down) confessing all his "false!!" allegations. Message was out and clear !! I saw the same in many other places. I would love to trace that again. Albet IE is after Google to censor your words, Truth is described as gnana khadga in Vedantic terms cannot be withheld, such is its nature, Mr Redact will soon realize !! AavaraNa and Vikshepa as Dr SL Byrappa puts it will not hold for long, it will be unveiled in multiple forms and forums eventually. satyam-Eva-jayatE, Good luck to you IE. caraI vEti, caraI vEti, Love and Blessings to you Ravinar !! It was the guy name "Chaitanya Kunte" who blew the Barkha Dutt and her irresponsible reporting. This same lady is justifying herself when she is acting as Government Spokesperson. lmao. Loved the toothpaste/root-canal analogy to explain. Obviously, objective of the blog is served, as the message has gone to readers, and the IE response through legal notice to Google betrays its nervousness! But it does take courage expose the scoundrels of the media. The Indian society should be grateful for your courageous service to bring awareness! I used to be a fervent reader of IE during my college days and some years after too... Arun Shourie and a team that made you examine all issues with a different perspective, but as those kind of articles stopped and all you saw was crap published, you realized that the paper had lost its edge a long time ago, it is more than a decade since we now DONT get IE at home and switched to TOI.. even though this paper was like a tabloid at times!!! Except for the non online folks, none of us even read the printed newspaper i rely on social media to give me the correct news!!! TY again for a excellent piece on their hypocrisy, they are afraid as they should be with the microscope turned on them!!! "I don't know of anyone in India who has your courage, knowledge, sense of humour, rigour and humility. I hope I will have the privilege of meeting you someday soon. 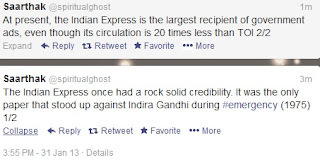 Sg has shamed the founding fathers of the express. I believe India is safe as long as there are people like you. More power to you and take good care of yourself…. Best regards"
Thanks for this comment. I love your website, though I rarely comment. I was wondering what had happened to you over the last few days. If you had not commented, I would have manually copied every single one of your articles to be carefully kept away. Thanks for sharing that that your website is backed up. Dont succuumb. Keep fighting. Good luck! And if you need any help, please post an article seeking help. We will all help in any way we can. Fitting complement and timely confidence booster. Keepup up the good work Ravinar. Poeple like you, niticentral, centrerightin, Vijayavani, Sandeepweb and host others are doing a yeomen service. We are proud of you and will not stop there, we all aspire to be able to contribute for the Nation's cause. Do we know whether the ex-Army chief who was defamed in Mr. Redact's Raisina fiction take any legal action against the latter? You make a valid point Ravinar. MC is not a news portal, it's only an analytical site. I am sure many of your readers (including me)don't come here to read news, but they come here after reading / watching news to learn whatever was skipped/edited/taken-out-of-context etc. But I guess this arm-twisting by media only shows that MSM is taking your words and words of other bloggers like you very seriously. They can see the people seeking out to learn the truth. IE was once my fav. newspaper and it is sad that they are stooping to such low levels. What many of the journalists and newspapers do not remember is once upon a time they too would have believed in exposing the truth and standing by the human principles, which however could not stand the test of time / money! Please keep up the good work, never before have I (and many more like me, belonging to the educated middle class of India)been more interested in following the current affairs of the country. Thanks to the work of people like you! true that! he is the Jon Stewart of India as much as I know of Stewart and Ravi! Mr.Redact is under severe delusions of grandeur.Strutting around at "Addas" and "Walks". He seems to think that he plays a part in running the country. Using familiar terms of address to his guests, posing stupid queries, putting words in their mouths. Can't stand the B***er. Sorryif it's a dumb question what is redacted and how is it used to denote SG of IE? Shekar Gupta is a con and false. Him and his Indian Express have been indulging in lie after lie, whilst taking dole money from Government (our tax money). One can say Shekar Gupta are the "poor" the CONgressi are helping to alleviate poverty. Your articles are extremely well written, incisive and in short brilliant. Pardon me for the comparison, but I am reminded of the wonderful columns of Arun Shourie who exposed a number of scams in the 80's when there was little access to information. Ironically he used to write for the then IE. Keep up the good work and be safe. Shekhar Gupta is the illiterate man's journalist. The enlightened dont read or see him at all. Ditto for the Barkhas, Arnabs, Thapars, Roys, Sardesais etc. Sab sasle chor hai or dusraon ko ungli dikhatai hain. Good one. Who is Alibaba now? Ravi.. I hope, Your Blog could reach to every Indian. Can you provide a Monthly or 15 Days Magazine assembling the Recent Blogs. If Magazine reaches in all Indian Languages, that will have huge Impact. Please let us all Twitterati know if any kind of Financial or Logistical support needed. I would try to my best. How about a site in Hindi / other Indian languages. Even you don't find articles of Mr. A Surya Prakash most of the good Articles been removed from the net. Ravinar I think people are fed up of all these biased news and instead of exposing Governments wrong policies and wrong doings whereas all the News Channels / NewsPapers are Justifying. Yes People like Arun Sourie and S Gurumurthy are very rare to find now. That is why people are looking for the place where they can voice their opinions not the experts who are Paid by the Government and these News Channels / Newspaper. If somebody asked me about Modi was grilled by SIT isn't case of upholding the Law by the State Chief Minister what have been constituted by the Supreme Court.Which congress leader appeared in these kind of commission and giving clean chit to their own people.Yes there is a difference between Popularity and Credibility. People can see themselves how congress's government after government try to supress the Bofors case but it is coming out the last one was in Income Tax Tribunal. Our HM Shinde rather than giving tough replies to Pakistan came out with Hindu Terror. Even after 5 Years any Government Investing Agency not been established any case against Sadhvi Thakur. Yes there should be thorough and Independent Investigation who plotted that conspiracy of Hindu Terror.What about the MSM cook up stories. Excellent article, needless to say, once again. Sir, when I had expressed my deep anguish and surprise to some of my journalist friends at the abyss the Indian Express had gone to; some of them offered an interesting/queer explanation. The Indian Express, he informed me, has been ditched by its owners--The mighty Goenka family--due to some family feuds. The IE soon afterwards was on the verge of extinction. They told me that after this the Indian Express and its editor Mr. Gupta went to any extent for their survival. That is why it became the biggest boot-liker of Sonia & Co. Its survival is now totally depend on "Govt Ads" and IE and SG can go to any extent to please their masters (Sonia & Co.) now. So knowing this truth let us have some mercy on them!!! just as burkha dutt got padma something and was deemed untouchable... radia tapes came along automatically... and she went down the drain. so you see nature has its own way of kicking a$$. you just wait for a year, not more than that. all this house of cards will fall. Unbelievable the levels that IE can plumb. Happy that this blog has made a huge impact. I'm as your admirer, proud of you :-) All the very best! !